Celtics #27 draft pick - Pt. 3 - French guard Elie Okobo? One of the most interesting prospects in the upcoming NBA draft is combo guard Elie Okobo. He is listed as 6'2" and 180 lbs. with a 6'8" wingspan. He has played in Europe since 2015, starting as a point guard but now learning the ropes at the two-position. In most mock drafts he lasts into the late 20's of the first round or drifts into the early picks in round two. The Celtics would have a good shot at acquiring him if nothing better presents itself prior to the 27th pick. He could possibly be a draft-and-stash candidate for a team, but he may be NBA material right now. In the video below, Okobo is seen recently scoring 44 points in a game, and his performance was outstanding. Normally, I would think the Celtics would shy away from Elie because of his lack of size, but his wingspan and physique negate that to a large extent. If he is still available at the 27th pick, Boston may be wise to acquire him. If he drifts into the second round, a last-minute trade to pick him up is something Danny Ainge has been known to do in the past. This guy could be a sleeper. 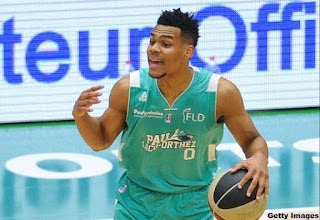 Should Celtics acquire European Elie Okobo with the 27th pick in the upcoming draft?